Just one week before the Golden Globes and seven weeks before the Oscars, Hollywood began polishing its acceptance speeches Saturday night at the Palm Springs International Film Festival’s 23rd annual awards gala. 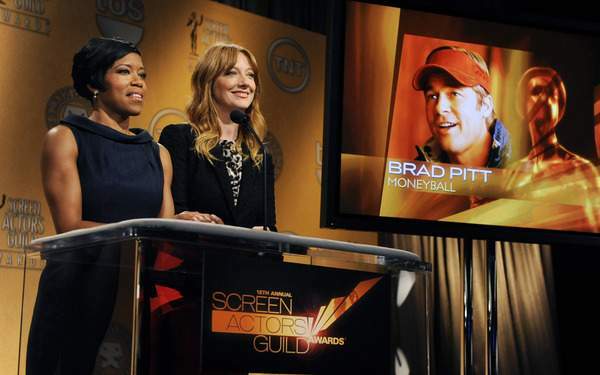 Palm Springs Film Festival gala is often a bellwether of Oscar nominations – 15 of last year’s attendees collected nominations for the 2011 Academy Awards. Michelle Williams, who was on hand to accept the Desert Palm Achievement Actress Award, said her thoughts were on Marilyn Monroe, whom she plays in “My Week With Marilyn” and who, unlike Williams, struggled to be taken seriously as an actress. “My only wish is that Marilyn herself could have experienced in her lifetime what I am experiencing tonight,” Michelle Williams said. Though the gala is “black-tie optional,” according to the invitations, most of the celebrities are considerably more relaxed than at other awards events. The Palm Springs gala isn’t televised and honorees already know that they’ve won, a fact that leads to some impromptu speeches. Multiple attendees compared the crystal award they received to a bong – “I may smoke this later,” said International Star Award recipient Gary Oldman – and obscenities flew fast and furious. “George Clooney closed the night with an f-bomb!” marveled the evening’s emcee, “Entertainment Tonight’s” Mary Hart. Mock serious speeches abounded – Tom Hanks watched, bemused, as his 14-year-old “Extremely Loud and Incredibly Close” co-star Thomas Horn bested him in smooth teleprompter reading, and Jonah Hill took a crack at his “Moneyball” co-star Brad Pitt, who was on hand to accept the Desert Palm Acheivement Actor Award. “Brad Pitt has constantly made choices that are risky,” said Jonah Hill. Brad Pitt, who was using a cane after, he said, tripping and falling while carrying one of his twins skiing, walked a 300-foot red carpet into the gala alongside partner Angelina Jolie. Other stars in attendance included Jessica Chastain, Charlize Theron, Glenn Close, Al Pacino, Olivia Wilde and Melissa McCarthy. Later, “The Artist” director Michel Hazanavicius was presented with the Sonny Bono Visionary Award by his stars, Jean Dujardin and Berenice Bejo, who is also the mother of two of his children. According to organizers said the event raised $1.6 million for the nonprofit Palm Springs Film Society.